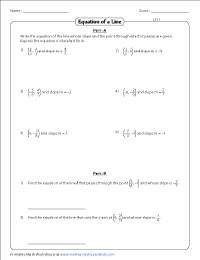 This exclusive ensemble of worksheets has been designed to help learners comprehend the basics of converting equation of a line to point-slope form and writing equation of a line using the given point and the slope. A series of exercises requires students to find the equations of a line that is either parallel or perpendicular to another equation of the line. 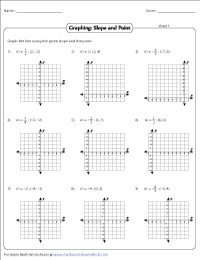 The worksheets based on graphing the line using a point and the slope are also included. 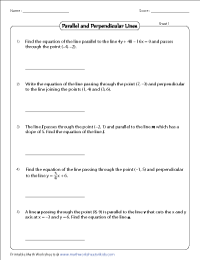 Write the equation of a line in point-slope form based on the slope and the point provided in this set of worksheets. There are ten problems in each worksheet. Based on the point and the slope provided for each question, apply point-slope formula to find the equation of a line and express the equation in slope-intercept form: y = mx + b. This level of worksheets features coordinates in the form of integers, and the slope provided can either be an integer or a fraction. In the second level of worksheets, the coordinates are represented as fractions and the slopes are either in the form of integers or simplified fractions. Find the equation of a line and write the equation in slope-intercept form. Find the equation of a line based on the given slope and a point and express the equation in standard form. The slopes in this collection of worksheets can be in the form of either integers or fractions whereas the coordinates are represented in integer form. 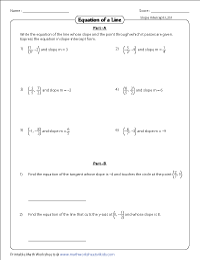 In this second level of worksheets, the coordinates are given as fractions and the slopes can be either in the form of fractions or integers. Apply point-slope formula and find the equation of a line. Represent the equation of a line in standard form ax + by = c.
Find the equation of a line that is passing through the given point and is either parallel or perpendicular to another line. Write the equation of a line in standard form. Download these worksheets for ample practice. Use this exclusive set of worksheets to graph the line based on the point and the slope provided. Plot the given point, mark another point on the grid using the given slope and graph the line. Use the answer key to verify your responses.